Over the decades it's been possible to track a small but beloved lineage of arcade football games that don't take the sport too seriously. 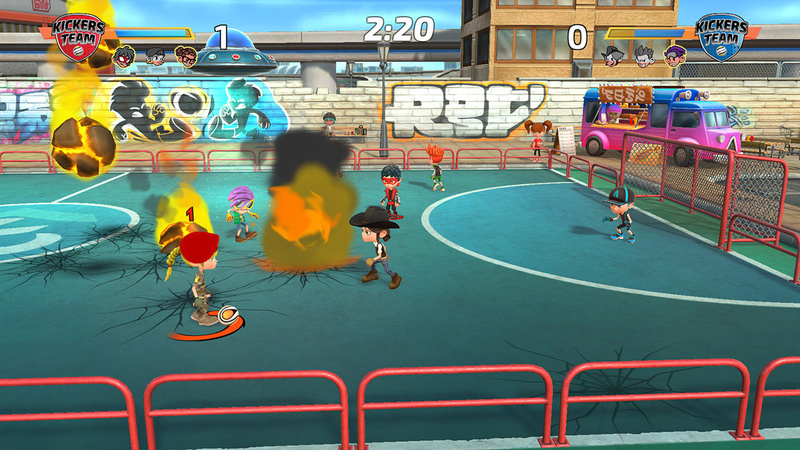 From SNK's Soccer Brawl through Sega Soccer Slam and on to Mario Strikers Charged, the best of these games embellish the footy basics with fantastical settings and improbable special moves. Super Kickers League would dearly love to be picked for this elite team of outlandish showboaters. Sadly, however, it lacks the vision, tight ball control, and sheer swagger to make the cut. This is a 3v3 variant of the beautiful game played on a small, enclosed pitch. The ball is always in play, and there's no referee to adjudicate on those crunching challenges. Heck, one of the two tackle moves here bears closer resemblance to football of the American variety. When in control of the ball, you only have a few things to consider. There are three kicks at your disposal: pass, long pass, and shoot. The right shoulder buttons give you a burst of pace, while the left ones initiate a little jink of some kind that can slide you past a careless challenge. 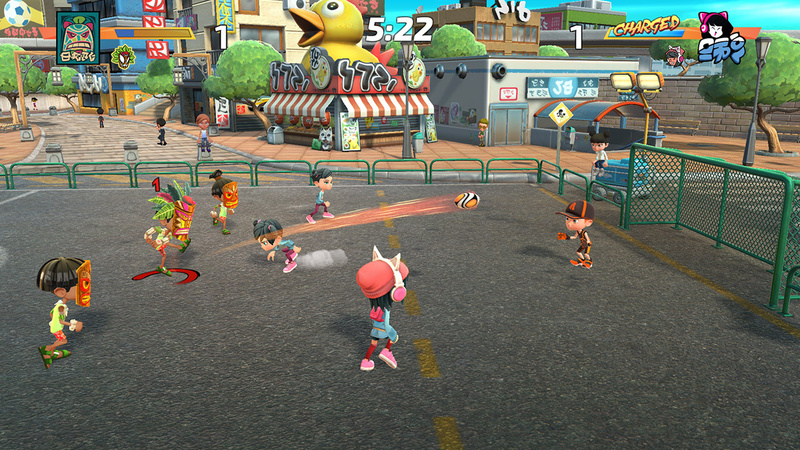 The X button activates a chargable special move, which is unique to each team. These generally don't prove overpowered or annoying, instead giving you things like an extra burst of speed or an exaggerated forward hop. One particular special move, however, stops your whole team in its tracks for a couple of seconds, which is all kinds of awful. All in all, though, this is a very simple take on football. Simplicity is fine, but if you're going to make an arcade-y take on a sport it needs to be even more fluid and exciting than the real thing. You need to exaggerate the good bits and gloss over the boring bits. 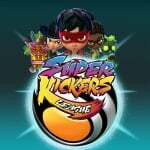 Super Kickers League's gameplay, by contrast, is stilted and rigid. Shooting is a case of getting within approximate range of the goal and holding the shoot button. The resulting effort either loops into the corner of the net or it doesn't, and little you do seems to affect that. Sometimes the ball will appear to blast right through the goalie, while at other times they’ll stop what looks like a guaranteed goal with an acrobatic parry. Meanwhile it's frustratingly impossible to pull off a quick snapshot on the run, unless the ball is played in the air - a move that in itself lacks any sense of weight or fine judgement. Defending isn't so much an art as it is a case of getting in line with the opponent and tapping one of the defensive buttons to take them out. Players don't seem to have a sense of solidity to them once a shot is taken, so there's no benefit in tracking a run or throwing yourself in front of a goal bound effort. With no penalties for roughhousing, turnovers are exasperatingly frequent. All of which might lead you to think that passing is the best approach, but this is simultaneously heavily automated and precariously unpredictable. It's very hard indeed to know where your team mates are when off-screen, despite the presence of indicator arrows. Everything looks okay from a technical perspective, with big chunky sprites and a fluid frame rate. But it all has the slightly soulless look and the generic character design of a mobile endless runner. There's an attempt at variation with the various teams, but they share the same basic characteristics and proportions. 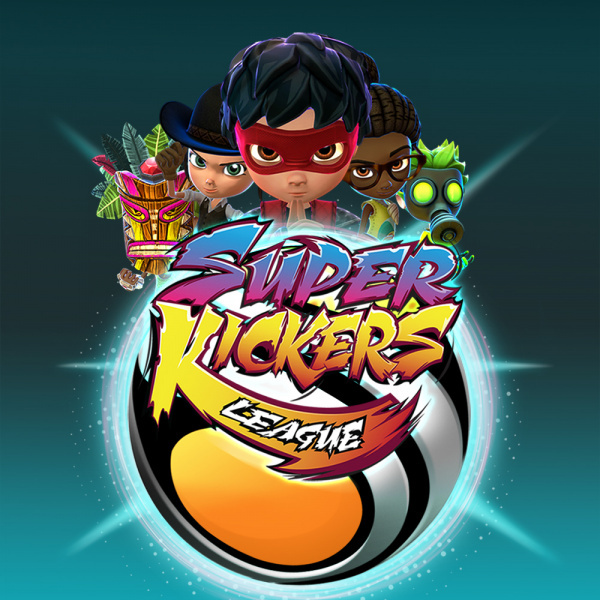 If you're not playing a lot of local multiplayer, the bulk of your time with Super Kickers League will be spent playing through its single player cup competitions. There's little fanfare to them, just a series of games against AI that veers between being impossibly dim and frustratingly adept - sometimes within the same game. One of the dimmest parts comes at the contested kickoffs, where we established a sure fire way to come away with the ball every time: just wait a beat for the opponent to run in and claim the ball, then slide in to take it off them. It works without fail. Elsewhere, we're not sure why the goalies feel they can handle the ball outside the area. Maybe it's because of the lack of refereeing. The game is full of odd little touches and design decisions like this. Then there are the incongruous meteor showers, or the fact that there's always an overtime period regardless of whether the teams are drawing or not (and with no stoppages, it sure ain't injury time). This sounds like nitpicking, and these aren't major points of detraction in isolation. But combined with Super Kickers League's stilted, one-dimensional gameplay, they suggest that the developer has somewhat missed the essential ingredients of football. What should have been a pacey, lively and unpredictable arcade-sports experience is more like an under-12s kick-around in your local park. Bummed to hear this is mediocre, however not too surprised. Just give us Mario Strikers Nintendo!! 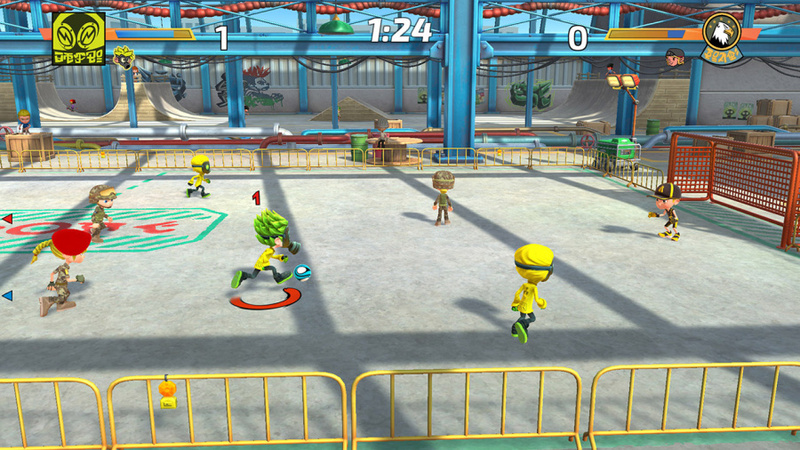 mario strikers, where are ya?! whelp Mario Strikers, it is then. Alright then, I'll just wait for Nintendo to release a new Mario Strikers or Sega to do a HD remake of Sega Soccer Slam. 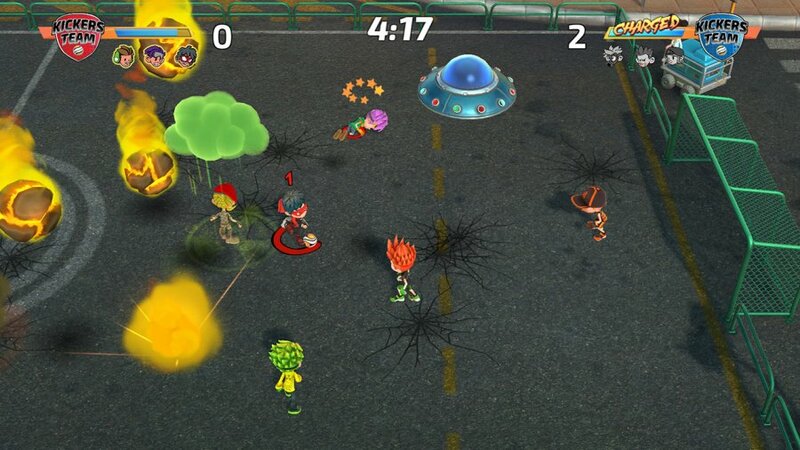 Where is Mario Strikers? It is my most wanted game on the Switch. Is it just me or are there just too many titles being released for Switch? It's better than the alternative, of course, but who has time to play all of these games? @StooBush I'm okay with a lot of games coming to Switch, the problem is too many of these are just cheap ripoffs or absolute shovelware.